This superb book is normally sold at $50. It is currently on special at 9.95! The book is out of print so the book is available in limited quantities. An invitation to those who appreciate fine cooking, innovative ideas, and modern design! From the marriage proposal to the big day, Wedding Days offers help and organization for all the festivities, while the unique meal creations induce a festival of the senses. A dream environment unfolds from the book’s 400 color photographs, embellished with unique flavors, special decoration tips, and solutions for making every couple’s dream wedding come true. 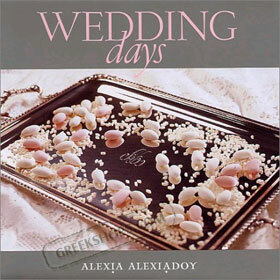 If you are planning your own Greek Wedding this book is full of great ideas for this special event. Hard cover. 252 pages. In English.